There are many ways in which patients can care for the teeth to ensure good oral health. However, there are aspects of the smile that cannot be controlled no matter how good a patient’s oral hygiene practices are. The alignment of the teeth is something that cannot be changed or controlled without professional treatment. Unfortunately, traditional orthodontic treatment options require many months of uncomfortable treatment, as well as special care and restrictions. 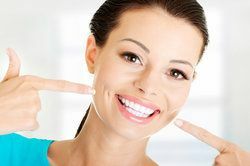 The good news is that porcelain veneers can be applied to conceal cosmetic blemishes, including poor alignment, uneven spacing, and crooked teeth. Through the application of porcelain veneers, Dr. Steven Hochfelder is able to offer his Lake Mary patients instant orthodontics, providing successful results in as little as two dental appointments. In addition, porcelain veneers hide other cosmetic blemishes, such as stains, discoloration, chips, and cracks. For this reason, instant orthodontics with porcelain veneers is an excellent treatment option for patients who have other cosmetic flaws that require treatment. Porcelain veneers treatment can usually be completed in just two visits to our dental office. The first visit will consist of planning the specifications of the veneers and creating molds of the teeth from which to fabricate the veneers. At the second appointment, the porcelain veneers will be applied to the teeth. We offer our patients two choices when it comes to porcelain veneers treatment, traditional veneers and no-prep veneers. Traditional veneers: Traditional veneers are extremely thin shells of porcelain material. However, in order to create an optimal fit, these veneers do require the removal of a small amount of tooth enamel. A thin layer of enamel is removed from the facial surface of the teeth where the veneers will be placed. Because the teeth are altered in this way, treatment with traditional porcelain veneers is irreversible, meaning that the teeth will always need to be fitted with veneers in order to protect the teeth. No-prep veneers: No-prep veneers are even thinner than traditional veneers. Because of this, there is no need to remove any tooth enamel. The surface of the teeth is simply roughened up slightly to allow for proper bonding. No-prep veneers are a popular option among our patients because it does allow the option to reverse treatment. If you are interested in instant orthodontics, Dr. Steven Hochfelder is happy to assist you in creating a straight and beautiful smile. Contact us to receive information or schedule an appointment with Dr. Hochfelder to learn if instant orthodontics is right for you. We look forward to hearing from you!